Bees and other pollinators play an outsized role in the world’s food supply, but it was often considered that their effect on coffee production was negligible. New research demonstrates that bee pollination can result in a 10 to 20 per cent ‘pollination effect’ in coffee. More than that, bee projects can contribute to improved livelihoods for coffee farmers and their families. “It’s common knowledge that bees are in jeopardy around the world, which is why this research is so important. Every day we learn more about how bees and other pollinators are indispensable players in food production,” said Janice Nadworny, co-director of Food 4 Famers. 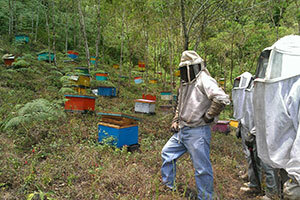 Researchers have been working to understand the contribution of bees to coffee production for decades. In Panama, Smithsonian researcher Dave Roubik found that bees accounted for 36 per cent of coffee production, of which 25 per cent was due to honey bees. In Indonesia, a team led by agroecologist Alexandra-Maria Klein estimated the bees’ contribution at 12 per cent. While coffee shrubs provide few nesting sites and food for bees, bee diversity and abundance depend on the presence of trees inside or around the coffee farm – demonstrating an additional benefit of shade-grown coffee. Forest surrounding a coffee farm can contribute to increased yields of 20 per cent, while reducing peaberries (where the cherry produces a single bean rather than the normal two) by 27 per cent. In countries like Mexico and Guatemala, where shade-grown coffee and diverse, rustic farms adjacent to forests are common, coffee agroecosystems host double the richness of bees, resulting in a 20 per cent higher fruit set – compared to specialized shade and sun-grown coffee common in Brazil and Costa Rica. Food4Farmers, which helps coffee-farming families address seasonal hunger, supports beekeeping projects in Mexico and Guatemala – with other communities throughout Latin America waiting to join in. Beekeeping projects were initially introduced to diversify income and strengthen food security, but new research points to improved income from coffee as well. In Chiapas, where Food 4 Farmers partners with the Cesmach coffee cooperative on a commercial beekeeping project, co-op members are beginning to understand the mutually-beneficial relationship between beekeeping and coffee farming. Given the 10 to 20 per cent ‘pollination effect’, it’s estimated that bees’ service in coffee agroecosystems could be worth US$9 million to US$18 million in the state of Chiapas alone; US$22 million to US$44 million in Mexico; and US$180 million to US$360 million worldwide. This doesn’t account for bees’ role in pollinating other crops that contribute to food security and livelihoods for all kinds of smallholder farmers. Food 4 Farmers is now raising funds to conduct research in Chiapas with Ecosur, colleagues from the University of Vermont’s Gund Institute, and CESMACH, to determine the degree and interdependency of relationships between bees and coffee. “The better we understand the relationship between coffee, and bee diversity and abundance, the more we can improve livelihoods and landscapes,” said Marcela Pino, co-director of Food 4 Farmers.